Nobody has been tending the landscaping at the former Wendy’s for a long time. 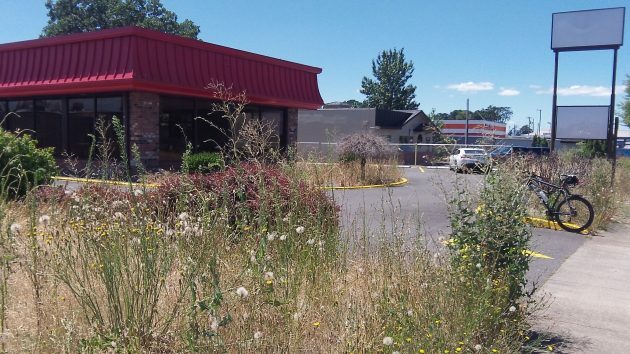 What used to be Wendy’s restaurant on Albany’s Pacific Boulevard has been closed for a year and a half, and the property has turned into a showcase of landscaping neglect. The fast-food restaurant closed in January 2015, along with Wendy’s in Corvallis, Eugene and The Dalles. Press reports at the time cited a dispute between the company, based in Dublin, Ohio, and the Eugene-based franchise operator as a reason for the closures. If anyone is planning to reopen the Albany restaurant, or use the property for something else, I don’t know about it. When I checked with the city planning department in May, no one had filed for any land-use permits. Property taxes were assessed on a maximum assessed value of $560,570. Last fall the tax bill amounted to $10,919 and was paid in full. My question: If you’re going to pay almost eleven thousand dollars a year in property taxes without blinking an eye, why not budget a few hundred bucks and hire a guy to water the lawn and take care of the shrubs until either the franchise problems are resolved or a new tenant can be found to operate the place? Maybe take a few good pics and send, along with a printed copy of your editorial, to the mailing address listed on the property tax statement. Nothing ventured nothing gained. Who knows, it could be just what the lawn doctor ordered. This is very common among absentee landlords. Whether it is a slum in Harlem, NY, or an abandoned Wendy’s franchise in Oregon, if the owner doesn’t have a significant current vested interest in the property, they are quite willing to ignore it. What’s $11,000 to a million- or billionaire? I’m a big advocate of the free enterprise system, but believe that there are responsibilities both legal and ethical that go along with the land. Albany should begin assessing penalties for this neglect. Yes. Classic out of sight, out of mind. The taxes are probably paid by some accounting outfit so owner doesn’t even give that much of a thought. Weeds so high that I almost missed your bike, HH. One might think you framed that shot on purpose. I really like first commenter’s idea. I inquired about the property several months back and learned that the rent is $10,000 per month and that there is no way they would consider a Cannabis business in it. Good! You have a contact. Maybe forward this ounce of public shaming?